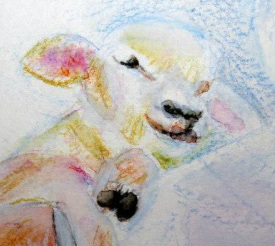 I was talking to a sister and I saw her like a little lamb in Jesus' arms, just resting there, at peace and joyful. It was so sweet, I just wanted to paint it so i would remember it. It is much like the prophetic portraits I do sometimes for individuals. I don’t need a thing.